Rest House for sale in Tagaytay from 2.6M up! Now you can buy a beautiful house and lot in Tagaytay that is surrounded by hundreds of pine trees at very affordable prices! Camella Silang Tagaytay is a newly-developed 20-hectare first-class subdivision just a few meters away from the Tagaytay rotonda. Camella Silang Tagaytay was inaugurated last May 2013. News Update for 2019: We now have ready-for-occupancy units (RFO) in Camella Silang at prevailing prices. Please contact us as soon as possible so we can make reservations for you. Hurry as we only have 2 units left! 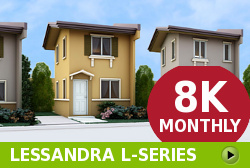 You have 8 beautiful house models to choose from! Camella Silang Tagaytay has a selection of beautiful Italian-Mediterranean-inspired house models for you to choose from. The contemporary architectural design, materials and finishing of each house are intended to complement the nostalgic environment that feels comfortable, homey and yet familiar. All house models have a built-in or optional balcony where you can take pleasure in having early morning coffee or late night get-together where you'll get to see and feel the splendor of Tagaytay from above. The interior of every Camella Silang Tagaytay's house model has been carefully designed to accommodate weekend gatherings and vacations in Tagaytay. Spacious kitchen and dining room are well laid out for your family and guests to prepare and enjoy frequent feasts. Each house model's high ceiling and many windows allow natural light and the cool breeze of Tagaytay to flow freely for everybody's delight. Your rest house in Camella Silang Tagaytay is so functional that you can actually make it your very home! In Camella Silang Tagaytay, house models have two storeys and at least three bedrooms for the comfort of your family and friends. The artist in you will enjoy designing the best layout of your house. For each floor, toilet and bath is conveniently situated to accommodate a full house. For sure, everybody in your house will enjoy their stay in Tagaytay. It's the ideal rest house. If you are looking for a house for sale in Tagaytay, Camella Silang is it! Following the great success of Camella Silang-Tagaytay which is virtually sold out, we are now offering houses for sale in Camella Alta Silang and Camella Alfonso. Both Camella Alta Silang and Camella Alfonso are 15-20 minutes away from Tagaytay City and feature the same amenities as Camella Silang. These villages also have cool climate, pine trees, rolling terrains, jogging paths, bird aviary, butterfly sanctuary and this time bigger houses and lots. Call us now and we'll take you to Silang, Tagaytay and Alfonso for free and see our beautiful villages! Integrated within the majestic entrance promenade is a garden setting and a meeting place for convenience, fun and relaxation. The basketball court and swimming pool are as grand and contemporary, all laid-out within the sprawling clubhouse. Also, jog and bike through the trails surrounding the village for a real mind and body rejuvenation! Here at Camella Silang Tagaytay, you have artisanal coffee shops to meet up with neighbors, a Finds Convenience Store, gift and other specialty shops. Exclusive Weekend Fairs will be set up within the premises of the community for you to get to know your neighbors and build lasting friendships. Other amenities of Camella Silang Tagaytay include a dedicated butterfly sanctuary and a bird aviary, playgrounds and pocket parks that will occupy almost a third of the entire estate, making it a sustainable, nature-friendly place for you and your family to live in. Camella Silang Tagaytay is a gated and secure community. The village is made more safe by perimeter fencing and a 24-hour CCTV at the entrance of the gate and a 24-hour roving security personnel within the village. You will have peace of mind while you are away from your Camella Silang Tagaytay rest house. Camella Silang-Tagaytay is being developed by Vista Land, the same company that brought to us Crosswinds. Crosswinds is a Swiss alps-inspired world-class exclusive community in Tagaytay City. Rows of picturesque chalets sit serenely on a lush terrain at one of the highest points of Tagaytay. This Swiss luxury resort is home to over 20,000 pine trees cultured and grown in the 100-hectare of property in Crosswinds. These same pine trees will be nurtured and tucked within the 20-hectare enclave of Camella Silang-Tagaytay. Expect to see the same level of luxurious setting in Camella Silang-Tagaytay. Feel the cool breeze of Tagaytay! Call us now and we'll take you to Camella Silang Tagaytay so you or your representative can confirm how beautiful it is! We'll make sure that you avail of our latest promos so you can buy your house in Camella Silang Tagaytay under the best deal! Camella Silang Tagaytay is now on Facebook! Our Camella Silang Tagaytay Sales and Information Facebook Portal is now online! Feel free to make friends and chat with our sales team to get the latest updates, discounts and promos. We're here to help you 24 hours a day, 7 days a week! Acquiring your beautiful property in Tagaytay is now easier than ever even if you are abroad! Camella Silang Tagaytay is just a minute away from the Tagaytay Rotonda. The village is located at the very border of Silang and Tagaytay, so you can enjoy the same cool breeze of Tagaytay right at your doorsteps. It is less than 5 minutes away from the north of the popular landmark, Tagaytay Picnic Grove, and about 3 minutes away from the cool views of Taal Lake. Camella Silang Tagaytay is a first-class residential community situtated on an exclusive 20-hectare property inspired by the beautiful and peaceful gardens of Italy. At Camella Silang Tagaytay, you will wake up in the morning to the refreshing scent of lush pine trees peeking by your window, mingling with the smell of newly roasted coffee beans. You will also marvel at the majestic sight of Camella Silang Tagaytay's rolling terrains and soothing landscapes embraced by the early morning fog that Tagaytay is known for. DISCOVER CAMELLA ALFONSO NEAR TWIN LAKES! Due to high demand for houses in Metro Tagaytay, we are now offering rest houses in Alfonso at very affordable prices. Camella Alfonso is 5 minutes from Twin Lakes. Bring happiness and prosperity to your loved ones. Buy a house now at very low prices and wait only for a short period of time before the value of your property appreciates. With the government's infrastructure project linking Sta. Rosa, Tagaytay and Silang under way, expect your property value to soar. And hurry, the corner lots in our inventory are limited! Please contact us now and we'll send the computation.